A Brazilian evangelical pastor, Marcelo Crivella, has been elected mayor of Rio de Janeiro in the second round of municipal elections. He won easily, beating left-wing candidate Marcelo Freixo by a margin of nearly 20 percentage points. Mr Crivella has promised to bring law and order and basic sanitation to Rio's poorer neighbourhoods. His victory shows the growing influence of evangelical politicians amid voter anger over a corruption scandal. Marcelo Crivella is a bishop in the giant Universal Church of the Kingdom of God, founded by his billionaire uncle, Edir Macedo - the main Pentacostal denomination in Brazil. Although Brazil is the largest Roman Catholic country in the world, the growing evangelical community now accounts for a fifth of the population. During campaigning the 59-year-old faced uproar over comments made in a 1999 book where he described homosexuality as evil and the Roman Catholic church as demonic. But Mr Crivella won easily, successfully distancing himself from the comments and promising to govern for Rio's residents, not the influential church from which he comes. Observers say his victory was also helped by voter anger over a second year of economic recession and the fallout from a huge corruption scandal involving many members of the former government of the left-wing Workers Party. The evangelical message has taken root largely among the poor in Brazil who before would have voted on left-wing lines. Several high profile cases of evangelical leaders caught up in corruption allegations, including the former leader of the lower house of Congress Eduardo Cunha, have yet to damage the movement. 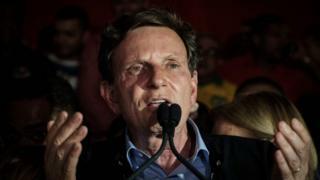 Elsewhere in Brazil's biggest city Sao Paulo, voters ousted incumbent mayor Fernando Haddad, once considered a rising star of the governing Workers Party, and replacing him with Joao Doria, a wealthy conservative businessman. Video Are Brazil's Catholics growing tired of the Church?